Another powerful intensive workshop where you can experience the power and possibilities of Holotropic Breathwork in a short-weekend full-group setting. 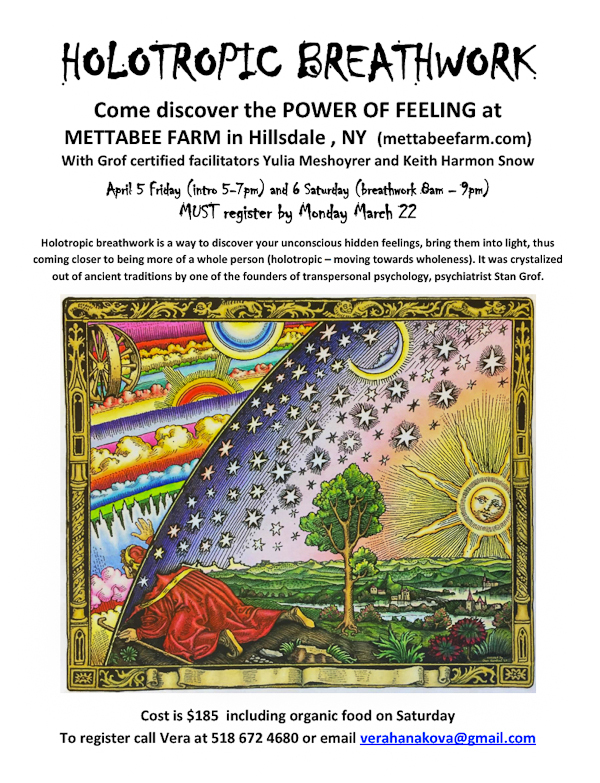 Join Grof-certified facilitators Yulia Meshoyrer and Keith Harmon Snow for a brief but powerful immersion in self-transformation at Mettabee Farm in rural upstate New York, just a few hours from Boston and New York City, and close to Albany and the Berkshires of western Massachusetts . Are you having problems with communication? Are you worried about the past or the future? Unhappy about the state of the world? Dissatisfied with talk therapy or spiritual practice that seem to get you nowhere? Unsuccessful in personal relationships? Or, wanting to share a deep intimate experience with your partner? Are you frustrated with old patterns, depression or anger that keep emerging? Seeking a new direction or a fresh perspective on life? Are you happy, for the most part, but unable to feel any sense of your life's true purpose? Wanting to connect with your Self and others on a deeper level? Ready for serious self-transformation? Are you seeking a deeper perspective on being? Holotropic Breathwork is a profoundly powerful but gentle means of entering a non-ordinary state of consciousness where the psyche moves freely toward its natural state of wholeness. Developed by pioneering psychologists Stanislav and Christina Grof, Holotropic Breathwork combines modern consciousness research, depth psychology, and ancient spiritual practices. 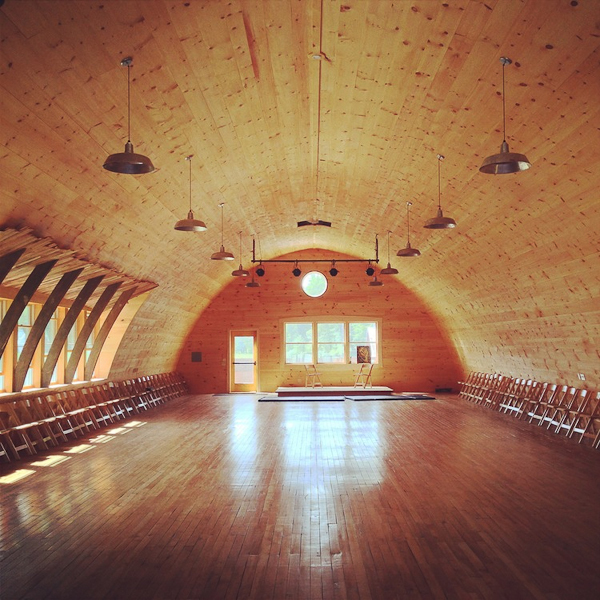 The process uses deep breathing and evocative music to immerse participants in their inner worlds, where the intrinsic means for healing and integration can emerge. Breathwork, through deep breathing and evocative music, facilitates access to all levels of human experience, including unfinished biographical material, birth memories, transpersonal phenomena, and residues of trauma stored in the body. Working together in alternating breather/sitter pairs the Holotropic Breathwork experience ensures a safe container to witness and be witnessed as we authentically journey into an altered state of consciousness. Sometimes, simply the process of witnessing and holding space (as the "sitter") for someone else (the "breather") can be as powerful as your breathwork journey itself. •	Experience a deep humility and wonder for all life. This weekend workshop will include nourishing meals and snacks; we will provide a light lunch and hearty dinner; people with special dietary needs are welcome and will be provided for. Further information about the location will be provided upon registration. We are inviting your participation in this one-day-plus workshop for a fee of $185, and we are pleased to offer a price of $150 for your early registration prior to 22 March 2019. Advance registration is encouraged; this workshop will be limited. Please register now.